The Range is a bricks and mortar store that has a growing online presence, offering customers a wide variety of choice from homewares and bedroom furniture right through to a sizzling BBQ for those summer days. I recently tried the Julian Bowen Elite King Size Bed , and as I am very fond of my sleep and catching some 'Zzzz's' I was more than happy to take on the task of telling you all about this incredibly luxurious bed. The Range dispatched and delivered the bed very quickly, it was on my doorstep within a few days of placing the order. It came in two large boxes with all of the bits and pieces needed to put it together, I cannot take credit for actually assembling the bed.. But I did watch and it was not over complicated at all. The frame is constructed out of wood, as are the slats that go across the bed to hold the mattress in place. From how it has all gone together I am confident that this bed is set to last, the finished bed is structurally sound and has so far demonstrated a real resistance to toddler bouncing. Unfortunately toddlers do bounce.. A lot. What I love about this bed is just how luxurious it looks, the high faux leather headboard is similar to one you would find in a fancy London Boutique Hotel, and it is all completely solid and finished to the standards I would expect of said swanky hotel bed. The Julian Bowen bed features a really impressive headboard that stands at 125cm off the floor. I have found it in-valuable for leaning against when I am reading in bed (Twitter counts as reading...right?). It is nicely padded so that I don't get un-comfortable when I am sitting there schmoozing what is being shown on the television, and for those mornings that I just can't bring myself to get out of bed just yet. 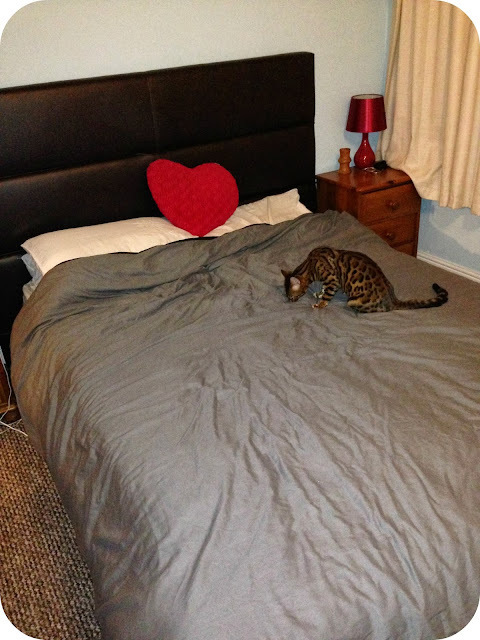 The measurements of this bed are 150cm by 218cm and after upgrading to a king size bed from a small double, it is safe to say I can feel the difference in the amount of room available to me on any given night. Even when Leo decides to come and star fish in the middle of the bed, there is still plenty of room for me to stretch out comfortably. After the bed arrived I had to upgrade to a king size mattress, and after only ever having hand me down mattress's I decided it was my time to spring for a memory foam mattress. I was obviously feeling like spoiling myself, and I am so glad that I did. This bed combined with the new mattress is actually my idea of heaven, and when Leo does decide he is going to wake up in the night because he has dropped his Lightning McQueen car out of the cot.. Well it just makes it even harder for me to prise myself from my bed. I absolutely love the look of this bed, and it is incredibly comfortable to sleep on. With the mattress on the bed it is quite a height off the floor, but how much depends on just how thick the mattress is you place on it. I quite like having this height when getting into bed, it makes it easier to get in and out of in the grand scheme of things. But even Leo can get in and out without any issues so it is not too high to keep the little people in your life at bay. If you were thinking of storing things under your new Julian Bowen bed, then this is where you may fall short. There isn't much room at all under the bed, and you definitely won’t fit any storage boxes underneath. Personally for me though this isn't an issue. I have a big double wardrobe with lots of storage capability, so anything that was once under the bed is now safely stored away in the wardrobe. I am actually quite glad that the bed comes down so low, as I am always finding things that have gone AWOL under the bed, so this gives me a fighting chance of actually knowing where things are. Having said that though.. It will be a struggle if Leo accidentally drops something down the back of the headboard, as that won't be very easy to get to. All I have to do now is invest in a new duvet cover set for the bed, and I have been checking out the selection over at The Range as they have some really nice items available. I have the perfect image in my mind, and I am actually opting for the Shimmer Black Bedding. I think this is going to look really great against the faux leather. 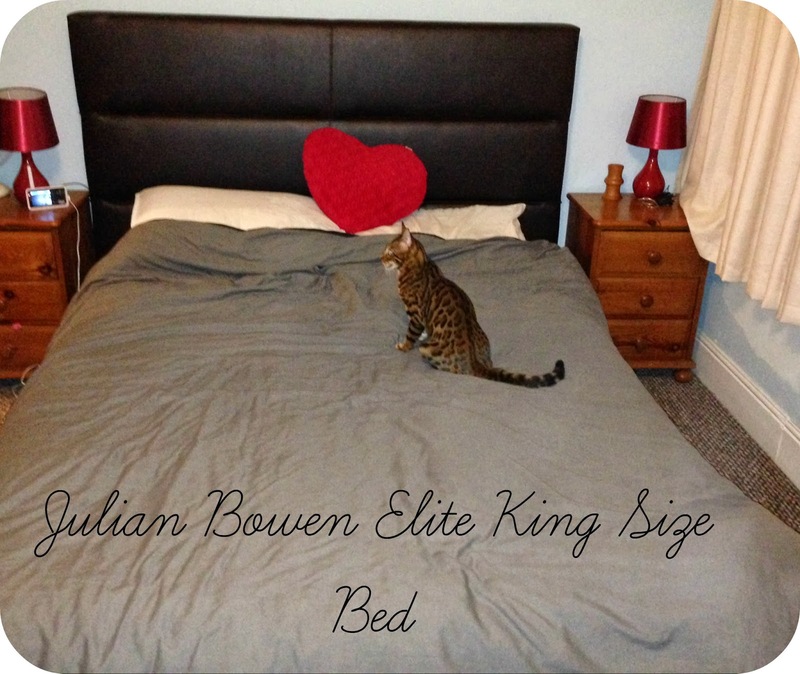 Over all I am really impressed with the Julian Bowen Elite King Size Bed. It is everything I could ask for, and has definitely made me look forward to bed time a little more each night. For the money it is actually a real bargain, it costs just £229.99 and includes free delivery. What more could you want out of a bed? Disclaimer: In Association with The Range.